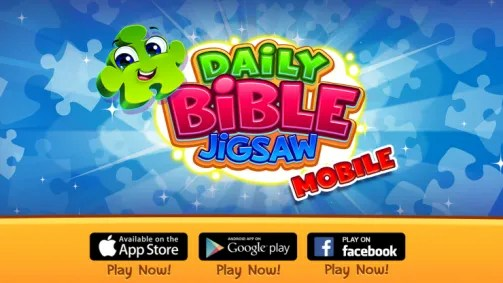 Daily Bible Jigsaw . . . My Review | My Journeys Through Life . . . Herding Cats In New Mexico! ← New Hairstyle With My Stylist, New Nails, & the Easter Bunny! from Google Play, and have been playing with it on my Android phone. I was given five hundred play coins in my account for the purpose of this review. 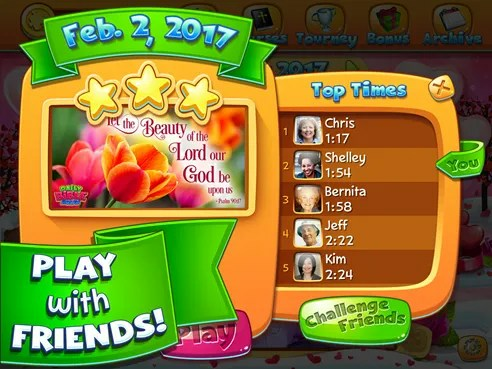 One Daily Bible Jigsaw puzzle is free to play every day, and you can play more puzzles by using some of your coins. You can earn coins by solving puzzles, by connecting the power piece within a certain time, or by watching commercials within the app for other games. I also do Google surveys to earn Google money! You can also purchase extra coins at prices which begin at $1.99 for 20 coins. 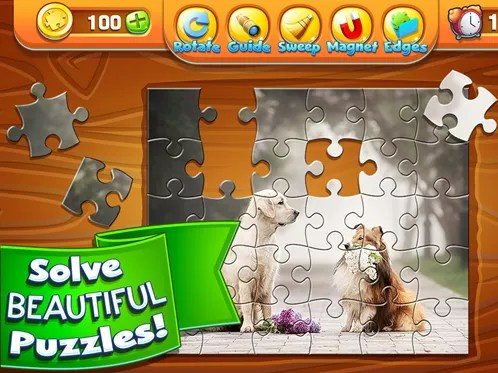 Along with the daily free puzzle, you can play bonus 56 piece puzzles for free. There are tools within the game to help you with the puzzles. They cost coins to use, although on some days one or more tool is free. My favorites have been the Edges (removes everything but the edge pieces), the Rotate tool (this turns all of the pieces to the correct position), and Sweep (moves single pieces out-of-the-way.) The Guide tool gives me a peek at the completed puzzle, and the magnet tool randomly connects two pieces for you. The pictures that show up when a puzzle is completed are very nice, and there is a Bible verse associated with them, although I don’t think it is from the King James Version, something my regular readers already know that I would prefer. However, I CAN always go from my completed puzzle to my own Bible and look up the verse for myself! I decided one day when the game asked me if I wanted, to open the game in Facebook. It’s been kind of fun to see the scores of some of my friends along side my own results! 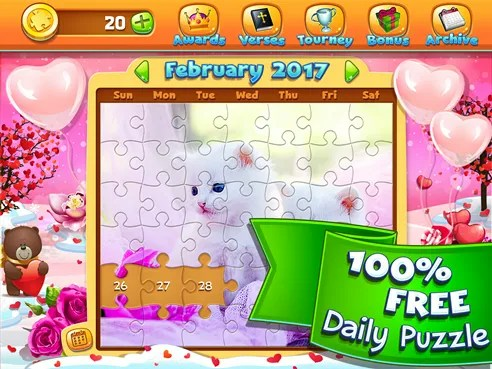 After you complete each daily puzzle, a new piece is shown on the calendar page. Once you complete each day of the month, the entire thing will be uncovered! I am still not much of a jigsaw puzzle fan, however, this has been helpful when I have just a few minutes to kill. It was also a good thing to have recently, as I was admitted into the hospital overnight. Just later that same week, I had to take “Mr. Loquacious” to the emergency room after he had a skateboarding accident and hurt his wrist. Having the Daily Jigsaw Puzzle from Planet 316 gave me something to do during the time we had to wait around! To read 89 other fair and honest reviews from my fellow crew members, please click on the banner below!